Our mission is to provide total quality transportation services that satisfy the complete needs of our customers. Smith Transfer Co., Inc. will strive to build strong customer relationships and a cooperative working environment through successful quality performance. Becoming Smith Transfer Company, Inc.
How was Smith Transfer Co, Inc. created? Smith Transfer Co., Inc., was founded by Tim Bray in 1998. At that time, Bray also owned a 3rd Party Logistics Company, Breck Logistics, Inc. Prior to 1998, Breck had developed an agency relationship with another asset based trucking company. That particular company was faced with numerous labor issues in another division which was causing problems for Breck. Bray wanted a trucking company that would compliment and fill the gaps in services Breck couldn’t accomplish. 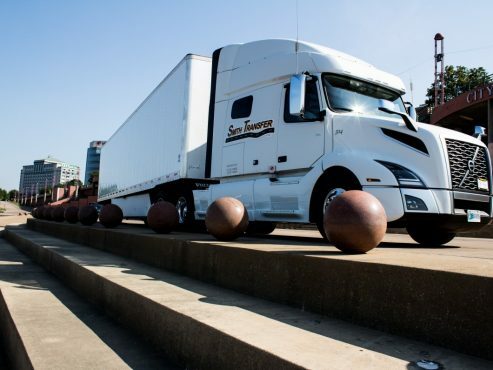 Thus, Smith Transfer Co., Inc. started in with 20 power units and 25 trailers in 1998. Today, there are 31 power units and 42 trailers in the fleet. Why the name “Smith Transfer Company”? Tim Bray’s youngest daughter’s middle name is Smith. Smith is also for Tom Smith, an associate who started his career with Bray at Saginaw Transfer Company, Inc. Smith and Bray’s transportation careers paralleled each other at Consolidated Freightways, with Smith rising to presidency of CF’s Conway Western Subsidary. Lastly, the acronym for Smith Transfer Company is of course STC, the same as Saginaw Transfer Company, where Bray’s transportation career began. It should be noted that there is no connection with the former LTL carrier that was located in Staunton, VA.